Description: Ogee full replacement fascia board 150 mm a full replacement 5 metre ogee fascia board. No backing timber required Dimensions 16mm x 150mm x 5m Colour: White .. Description: Ogee full replacement fascia board 175 mm a full replacement 5 metre ogee fascia board. No backing timber required Dimensions 16mm x 175mm x 5m Colour: White .. Description: Ogee full replacement fascia board 200 mm a full replacement 5 metre ogee fascia board. No backing timber required Dimensions 16mm x 200mm x 5m Colour: White .. Description: Ogee full replacement fascia board 225 mm a full replacement 5 metre ogee fascia board. No backing timber required Dimensions 16mm x 225mm x 5m Colour: White .. Description: Ogee full replacement fascia board 250 mm a full replacement 5 metre ogee fascia board. No backing timber required Dimensions 16mm x 250mm x 5m Colour: White .. Description: Ogee full replacement fascia board 405mm a full replacement 5 metre ogee fascia board. No backing timber required Dimensions 16mm x 405mm x 5m Colour: White Please note this is a double edged board it does not have a cut edge, if you need a straight cut ed.. Description: White 90º External Corner for 16mm Ogee Fascia .. Description: White Stick On Fascia Internal 500mm corners 90 degree .. 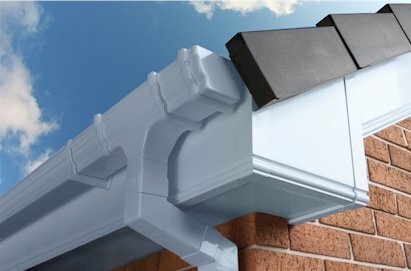 Description: 300mm Joints for 16mm Ogee Fascia ..
Silicone 700T is a fast, neutral cure, low modulus sealant specially formulated for the PVCu and roofline industry. For perimeter pointing window and door frames, sealing plastic roofline areas and general weathersealing. Now contains a powerful anti-fungal compound. Colour: White ..